Helps maintain a balanced nutrient-limited marine aquarium by enabling the hobbyist to enhance the rate of microbial growth and reproduction, increasing the rate of phosphate-reduction and denitrification; this is of particular benefit in heavily-stocked, well-fed reef aquaria. Replaces “vodka method” of microbial activity-enhancement with a completely safe and biologically-sound, non flammable alternative to using vodka or ethanol. Indirectly benefits corals and other suspension-feeding invertebrates by encouraging reproduction of bacterioplankton (an important food source for suspension-feeding invertebrates). Encourages polyp-expansion in all corals. Shake product well before using. The main goal of using Reef BioFuel is to provide a source of organic carbon to bacterioplankton, enabling them to assimilate available phosphate and nitrate into new biomass (removing these nutrients from the water column and making them unavailable for uptake by cyanobacteria and algae); the resulting increase in bacterioplankton biomass is then removed from the aquarium via protein skimming and through the feeding activities of suspension-feeding invertebrates such as corals, clams, tube worms, tunicates, sponges, and their respective allies. In this fashion, good water quality is maintained, a food source is provided to many aquarium inhabitants, and a large percentage of the assimilated nutrients are directly removed from the system (via protein skimming). Do not use this product in any aquarium in which active and effective protein skimming is not in use. The skimmer may be turned off for a few (e.g. 2 - 6) hours following addition of Reef BioFuel to the aquarium to enable nutrient uptake and assimilation, whereupon skimming should be resumed; the use of a timer and automated doser to control protein skimming and dosing is a simple and effective means of accomplishing this. Alternately, the product may be effectively employed without turning skimming off at all. Grossly overdosing Reef BioFuel will not significantly increase the effectiveness of the product, nor the rate at which it enacts changes in aquaria; in fact, it may have a deleterious effect on water quality if not used as directed. The following recommendations are based upon extensive testing and will produce the best results in most aquaria; dosage may be adjusted according to perceived benefit to aquarium with time. Medium- to High-nutrient Systems: Add 5 ml (1 capful) per 50 US-gallons (189.3 L) [≈2 drops per gallon (3.8 L)] of aquarium water daily. Monitor concentrations of phosphate and nitrate with accurate test kits; phosphate and nitrate should eventually become immeasurable (or nearly so) when a balance is reached between the rates of nutrient-input and nutrient-assimilation. Thereafter, switch to “low-nutrient” dosage (below). Low-nutrient Systems: Add 5 ml (1 capful) per 100 US-gallons (378.5 L) [≈1 drop per gallon (3.8 L)] of aquarium water daily. With time, hobbyists may determine that decreasing the dosage and/or dosing frequency by up to 50% sufficiently maintains a low-nutrient environment. During changes in biological filtration or when increasing the aquarium bioload, dose 1 drop per 50 US-gallons daily for one week, then resume “low-nutrient” dosage. Purified water, proprietary blend of ACS Reagent-grade organic carbon sources. The concept of biological filtration is simply to utilize living organisms to remove substances from aquatic systems as a natural result of their respiration and metabolic processes. This mode of filtration is at work in any aquarium system housing live organisms, though microbes (e.g. various types of bacteria) are arguably responsible for the majority of nutrient-remineralization that takes place; oceanographic studies have shown that up to 90% of the dissolved organic carbon present in seawater may be assimilated by planktonic bacteria (bacterioplankton) into new biomass. This nutrient assimilation simultaneously removes nitrogen (as ammonia, nitrite, and nitrate) and phosphorus (as phosphate) from the water, making bacterioplankton a very effective sink of dissolved organic material that would otherwise fuel the growth of organisms such as cyanobacteria and filamentous algae in aquaria. Bacterioplankton are also an important food source for organisms that are able to capture them from the water column. In a sense, utilizing these microbes to control dissolved organic material and then gradually removing the microbes themselves on a continuous basis through protein skimming and the feeding activities of corals, clams, tube worms, tunicates, sponges, and their respective allies, becomes an effective means of nutrient-harvest. Simultaneously, it promotes the health of these suspension-feeding organisms through constant feeding (encouraging polyp-expansion in many types of corals), and promotes water quality. The entire process requires that adequate carbon be present in a usable form. In aquaria with a tendency towards elevated phosphate and nitrate concentrations, an appropriate source of carbon may quickly become depleted. 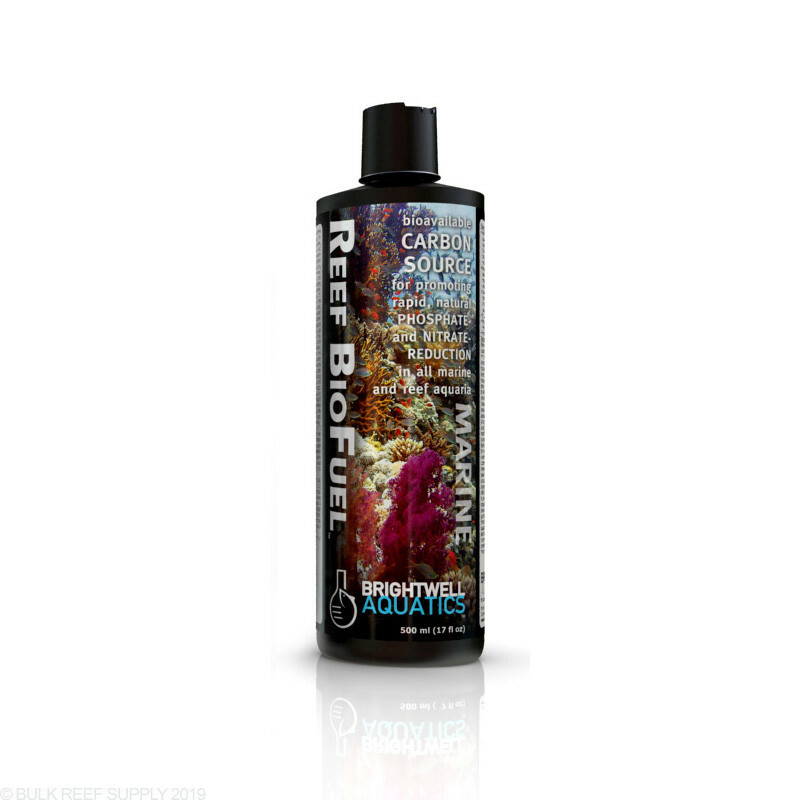 Reef BioFuel provides a source of bioavailable carbon to ensure that nutrient remineralization is efficient and effective. Used it as instructed and killed 80% of my corals. It sucked all my nutrients out of the water. unbalance my system and really didn't lower my nitrates. Tried this but after a few weeks didn't see much change. Stick to frequent water changes, fastest and safest way to lower nitrates. You certainly have the ability to run GFO while doing carbon dosing. The issue some people find is if the bacteria does not have a proper amount of Nitrates and phosphates in the aquarium the bacteria which consumes them in a balance tends to not do as well. In most cases the GFO will reduce the levels not enough to eliminate its use however if phosphate levels are testing below 0.03 it would be a good idea to halt the GFO while running the Reefuel. Feel free to let us know if you have any further questions!